All teachers and educationists unanimously agree that learning happens best when it is experiential. That is why there is an increasing thrust towards making the school syllabi life-centric, to narrow the gap between the classroom and life outside the classroom. Textbooks are being rewritten so that students can relate their textbooks to their lived experiences. However, what happens when the topics to be taught fall completely outside the domain of our lived experience? The human experience is circumscribed by the limitations of our senses. So, how do we tackle in the classroom concepts that cannot be seen, heard or felt – at least not in the humdrum of our life on earth? For a teacher, this could be a great opportunity to open up the imagination of the child. Even a science teacher should not shy away from it. There is a general belief that science is all about logic and rational thinking, but without exercising his imagination could Einstein have asked himself the question “What would happen if I travelled on a beam of light”? Microgravity is one such concept, where the science teacher can literally take the students on flights of fancy – way above the surface of the earth. But if the students want to survive in their flight, in their weightless existence high above the earth, their principles of physics should be rooted to the ground. If you dropped a rock from a roof that was five meters high, it would take just one second to reach the ground. 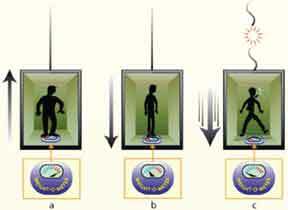 In a reduced gravity environment with one per cent of Earth’s gravitational pull, the same drop would take 10 seconds. In a microgravity environment equal to one-millionth of the Earth’s gravitational pull, the same drop would take 1,000 seconds or about 17 minutes! Subha Das Mollick is a documentary filmmaker and a teacher of media and film studies. Earlier she has been a Physics teacher in Mother’s International School, Delhi and St. Xavier’s College, Mumbai. She can be reached at subha.dasmollick@gmail.com. Partha Bandyopadhyay is a Professor of Physics at City College, Kolkata; a passionate science popularizer, he used to anchor the science programme Quest in Doordarshan. He can be reached at pbandyo@gmail.com.